This post is part of For the Family’s He Said/She Said series. My husband, John, and I shared our perspectives on our adoption journey. Keep reading for both sides of the story! When I met Tricia she was the young mother of a baby boy, so we’ve had children in our relationship since our first date. We never got a honeymoon phase, and I always said that we were getting an early start. I set my mind on the someday when we’d be empty nesters and get our lengthy one-on-one time together on the other end of the intense parenting years. Then, as our children started getting older, I kept thinking about what it would mean to have an empty nest. There would be fewer complications and more free time to pursue other interests, like going to work in an orphanage in a third world country. But Tricia wasn’t up for that idea at all. The idea of no running water or flushing toilets didn’t appeal to her. God began taking our focus off of “self” and opened my eyes to my family. As I prayed, I realized that maybe the call to care for more children wasn’t a call to an orphanage, but to orphans. Then one day Tricia approached me about adopting a little girl from China. We prayed about it, thought about it, and decided to pursue it. It took a lot of time and money to get our paperwork in for a Chinese adoption, and then — miraculously — God stopped our process. What should have taken months took years. And this adoption still isn’t completed. It was hard to see my wife cry in frustration when things didn’t go as planned, but there was nothing we could do. This adoption was in God’s hands. Then, Tricia’s friend approached her one day and asked if we would consider adopting domestically. We were interested but cautious. I was fearful Tricia would get her heart broken again. We met with the birth mother and shared with her our thoughts on family. A few weeks later she told us that she chose us. We were overjoyed! After adopting Alyssa, I thought our family was complete, but God had other plans: He had more children in mind for us. God placed it upon my heart that there were lots of children right here in Arkansas who needed a mom and a dad. The problem was we had the capacity to care for children, but we couldn’t afford it. With the expenses we’d already paid with both the China and the private adoption—and a job change with a lower income—we couldn’t find extra money to pursue another adoption. Then, when talking to a friend, I learned that it didn’t cost anything to adopt from the state foster care system. That night when Tricia called me from the MomLife Retreat, I was excited to share the news, and that’s what started the ball rolling. As a man, my biggest concern with adoption had to do with the logistics. I considered my stage in my career, the work of caring for small children, ensuring I had an adequate home and cars that were large enough, etc. I also wanted to make sure that my health was good—that I’d be around as they grew into adulthood. Additionally, I struggled with not having that “empty nest” time. I looked forward to that time, but I still felt adoption was the right thing to do. I felt God challenging me to live beyond my selfishness. For example, I enjoy watching movies, woodworking, and bike riding. I also like to relax, but all the self-indulgent idle time for which I long will not produce anything of equal value in comparison to loving, raising and discipling children for the kingdom. Even though I had concerns about basic care, nurturing, feeding, and educating these kids, I came to understand that I don’t have to have the best or the most perfect. The most important thing that we can give to orphans is a commitment to love them and give them a forever family. Of course this is easy to talk about but hard to do. When it came to adopting from the foster care system, things happened fast. In a couple of days we went from not knowing these kids, to picking them up to make them part of this forever family. The night before we picked them up I could hardly sleep. I was worried about what I was doing to my wife, myself, my other children. Would the needs of these new kids be too much? Was this the right decision? Pure and genuine religion in the sight of God the Father means caring for orphans and widows in their distress and refusing to let the world corrupt you (NLT). God gave us this verse at the perfect moment; His Word calmed our fears and told us we were on the right path. Tricia and I praised God and worshiped Him that morning, knowing that He was calling us to adopt. It was a moment we’ll look back on for a long time. Because of that verse given to us at that moment, we never wavered that God called us to these children, even during dark days. Instead, take a step of faith. That’s where God will meet you, and He’ll take care of the logistics. I first thought about adoption around 1999 when I was reading an article about orphanages in China filled with baby girls. At the time, John and I had three young kids ages 10, 7, and 5. I had also just gotten my first book contract. I talked to John about adopting an orphan, but he didn’t think it was a good idea. The idea of adding more kids into our chaotic life wasn’t appealing to him. Not to mention the cost, which was $20,000+. Oh, and I should mention my propensity to take on more than I can chew. One of John’s roles in life is to protect me from my good intentions. Years later the kids grew up, and John was the one to bring up the idea of adoption with me. I jumped on the chance. I was SO excited about adopting a baby girl from China, but just as we turned in our paperwork, in 2008, things changed. They slowed down the number of adoptions. It looked like a 4-5 year process. I was heartbroken. Relinquishment. Peace came as I surrendered my will to His. I wanted a baby girl from China, asap. Instead, I relinquished my dreams to Him. I started praying, “Lord, give us the child you desire for us at the right time.” It wasn’t about a cute baby. It wasn’t about me. It was about God’s perfect purposes for His men and women — and children — on earth. Trust. When I relinquished my will, God began to work. We were approached (through a friend) by a birth mom about a newborn. Were we interested? Yes! In March 2010 God gave us the most beautiful baby girl I’ve ever seen. She wasn’t the child for whom we had worked so hard, but she was a gift. Faith. Two years later I was confronted by the idea of adoption again when our church hosted the “Arkansas Heart Gallery.” Our foyer was lined with photos of kids who needed forever homes. These were older kids; many were ethnically diverse. They were kids from the foster care system, and their parents had lost their rights. They were now wards of the state. My heart was tugged, but I questioned how interested John would be. This was a whole new thing. Adopting children with baggage and attachment issues was different than adopting a baby. I mentioned children from the Heart Gallery a few times in passing, but I didn’t think much more about it until I read a book called Kisses for Katie. It was about a young woman who adopted thirteen children in Uganda. I read the book on the way to a MomLife retreat, and I was moved. I felt God speaking to me, “If she can adopt thirteen children in a third-world country, can’t you open your home to a few more?” I felt led to ask a few friends to pray that John’s heart would be open to adopting from the foster care system. 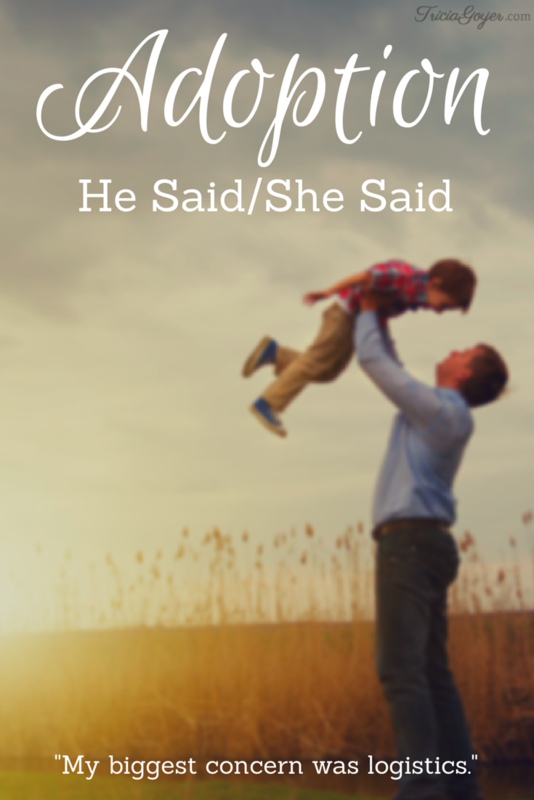 Later that night, when I called home, these were the first words out of John’s mouth, “Did you know that adopting from the foster care system is free?” As I heard my husband’s words, my faith grew. 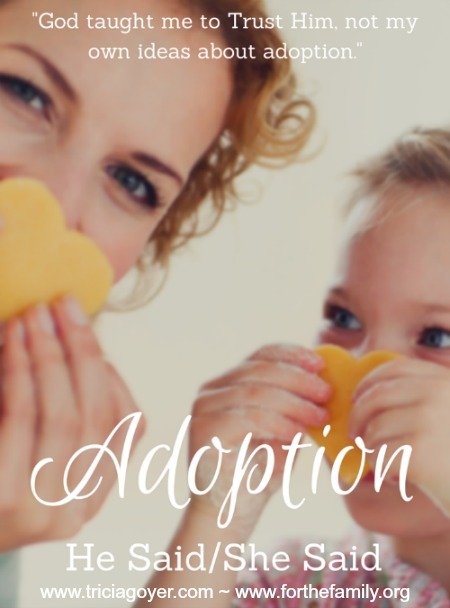 Adoption wasn’t “my” thing that I needed to “talk my husband into.” Adoption was on God’s heart. God is the one who creates families, and I’m honored to be on this journey with God and my husband. 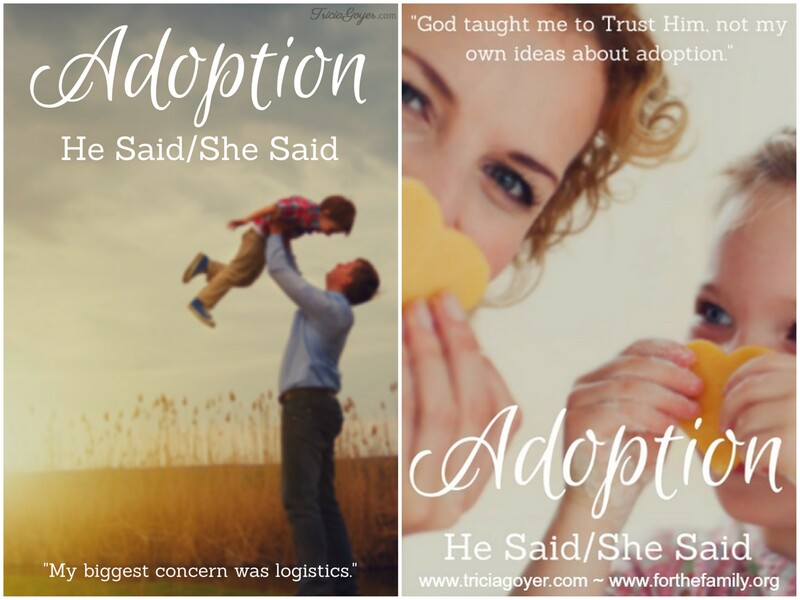 With each step God is teaching me to trust Him — not my own ideas — about adoption. Read the original He Said, She Said posts here and here! John, I especially liked this part of your half of the article: “maybe the call to care for more children wasn’t a call to an orphanage, but to orphans.” What a great shift in perspective. I’m so excited about the things God is doing in your family. You and Tricia really have huge hearts, and that’s a great testimony in itself. Tricia, two things really jumped out at me about your half of the article. First, the part where you said, “Peace came as I surrendered my will to His.” I’m working on this myself, only about meeting my future husband instead of about adopting kids (although I’d love to travel that road too someday). Second, the part about the photos lining the foyer of your church. It’s a modern-day orphan train! 🙂 I didn’t know things like that still happened. I’m seeing a time-slip story there. Thanks so much for opening your house, hearts, and lives to so many beautiful children. God is doing great things in your family, and I’m so happy for you guys!